Short video shot at the opening night of the DNA Hub exhibition ‘RockPaperVideo’. 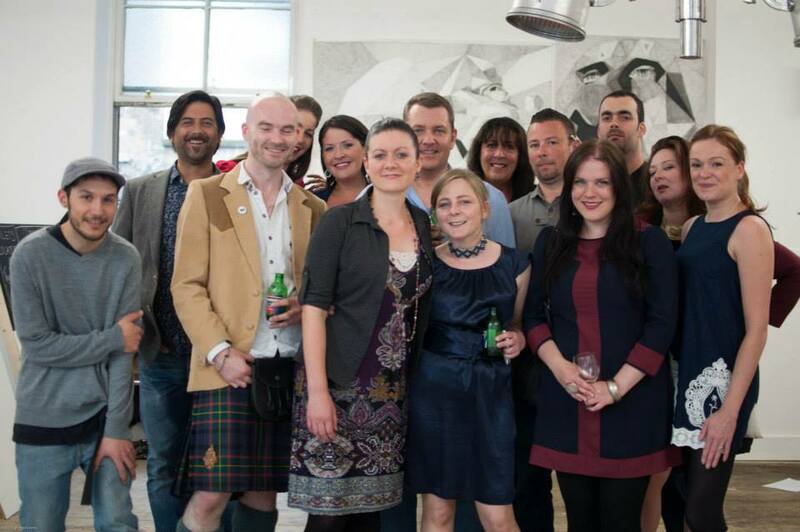 There were 17 artists takings part and the opening was brilliant. From 6pm the room was jam packed through to 10pm and the atmosphere was brilliant. This is my feature in the most recent edition of Room & Just Property Magazine, the source link for the online version is here and I am on page 59/62. 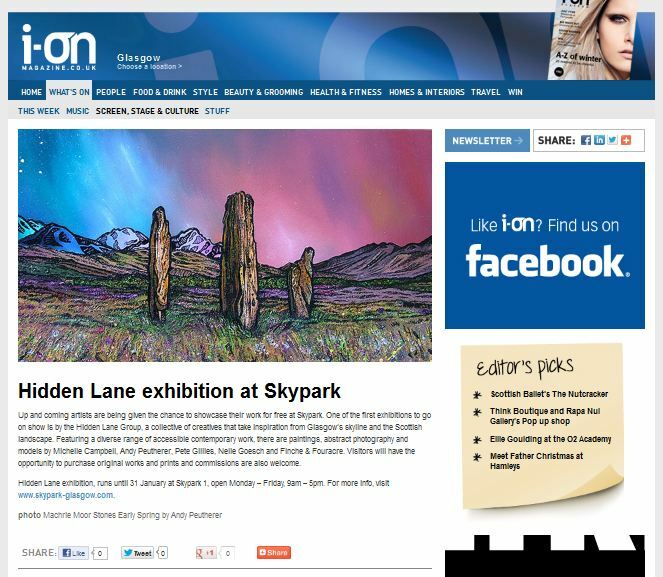 Online article from STV about my recent exhibition. 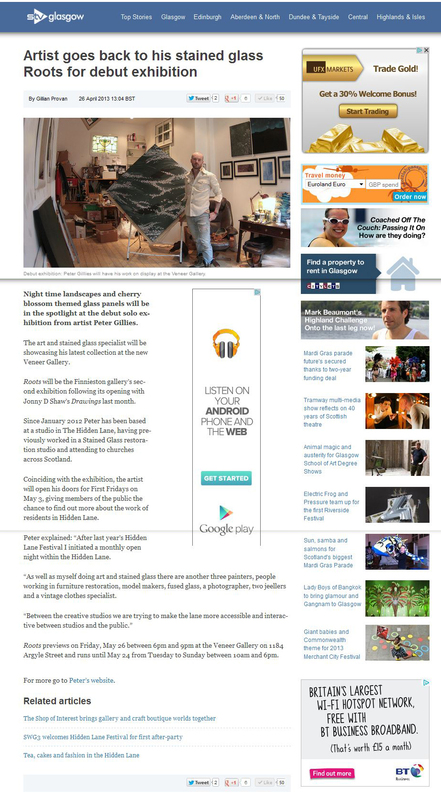 Following on from my exhibition in Christo’s Gallery on Great Western Road I am pleased to announce my first solo exhibition in Finnieston’s newest gallery space called Veneer. 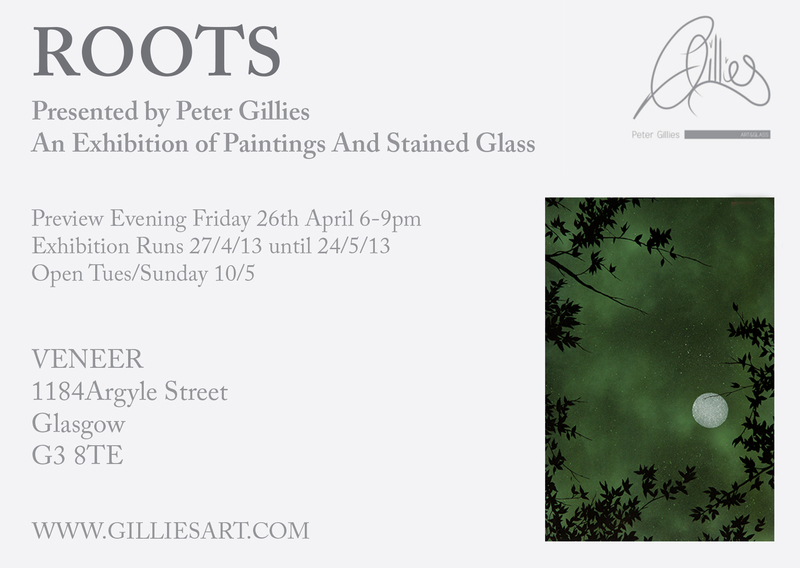 The show is entitled ‘Roots’ and previews on Friday the 26th April from 6/9pm and runs until 24th May. The show is entitled ‘Roots’ after the title I gave a large leaded window I made in 2006/7. This panel served as a display piece for shows I did over the next few years but it is only at this exhibition I shall be displaying it as it was originally intended suspended from the roof by chains in a window. Along side the set of oak framed smaller pieces which have also never been displayed. Roots is also about where I have come from and where I am today. This being my debut solo show I felt it was fitting. When I was a kid I spent the journey to school on the bus traveling down Loch Ness looking out the window at the scenery listening to tapes on my prized possession cassette player. Before high school I only had two tapes, Thriller by Michael Jackson. Side one, side two, side one, side two, side one, side two pretty much until the battery ran out. And my mums exercise compilation cassette taped off the radio circa ’85. It was a quality compilation with the exception of ‘Frankie’ on side two. I still hate that song. Later in High school I had other tapes, mostly variations of the same songs made up from my limited Cd collection and Stephen Gordon’s copy of Led zeppelin Remasters collection, cassette two which I ‘borrowed’ for a long time. It was looking out the window on the bus that I think most of the ideas I would come to have later were formed. Walking the dog in the evening with my David Bowie Singles Collection tape also featured a lot. I got into painting properly age 25 and since then have been trying to find a way to make the production of my art a way to live. Forwarding to 2013 age 32 I have currently produced more work in the first 4 months of this year than I have in many many years. The pace has been raised, the ideas are moving in a positive direction. And later this week I shall be opening this show which I will showcase all my currently new work. If you are familiar with my facebook page you will of seen in the last few weeks some of the new ideas and my recent Blossom paintings which I am enjoying very much. Of course computer screens in no way compare to reality so I encourage you to visit the exhibition in the four week duration, or see my studio which always has an open door to visitors. I have a fair bit of promotion to do in the next few days as this show was arranged only 2 days ago, I would of preferred a couple weeks to notify press and prepare my posters, flyers and such. But it is what it is and I shall just work with the time I have. After so many years working on my art this show is quite important to me, its great to have a whole place to myself to exhibit and its a fabulous space. Some kid, with a tape player and headphones glued to his head, sold someone a drawing of a wolf in the Inverfarigaig Forest car park for five pounds sometime around 1989. Some kid with a tape player and headphones glued to his head has been practicing. Still listening to Thriller, he no longer makes money in forestry commission car parks or draws wolf heads but he has taken the visual input of that time, and forged a creative path of his own making which leads us to today. Made a lot of changes recently (this 2012/13) as I try to optimize myself & my artistic practices. And its time to rock n roll this show. I feel more creative than ever before, I wouldn’t say I am at any peak of my abilities but definitely in control and have the great desire to step up the speed of everything. Since getting the web site up & having the print range in place I have been feeling more confident in speaking to galleries & in the last few weeks have sorted out several exhibitions around Glasgow, up in Aberdeen and down to London. With this upturn in career movement I will, over the next few weeks especially, be outlaying even more money than usual producing the work for these shows, delivering etc. So I decided to make a donation button should anyone wish to contribute to my materials. I spent some time on Kickstarter looking at projects, but I don’t think I need that middle man. I know my customers and you guys know me. So if you can not afford to buy on of my prints right now, or maybe nothing takes your fancy, the next week would be a very good time to make a small donation to help me get this new show together. I am looking at trying to get around, well lets just say its alot, for all the materials involved and things like couriers shipping and moving myself & my work around. It something I can never achieve on my own, understand it is what I have been trying to do for the last 7yrs but I never make enough in one go to use proactively and move forward, for example thats why its taken me so long to get this web page. And as I’m finally getting calls for exhibitions now I need a boost to prepare.. Essentially if you like my work & want to see what I shall do next you can have a direct part in that. Donate the price of a pint or two. Or buy a print from £12/60 from the work section there are loads to choose. Spread the word on your social media and help me get a show together. Thats a only brisk general run down of things. So you can kinda see for the last 7yrs I have already been supporting the equivalent to a high level crack habit doing art. And now on the cusp of things finally moving forward I need to spend a fantastical amount. Hence the help shout. It was around this week in 2011 that I traveled from Edinburgh through to Glasgow to view a Art Studio in a place called The Hidden Lane. I made the decision to just take it and signed the lease days later moving over on the 4th of January 2012. So as this week I finished my last craft show of the year it seems fitting that I kind of take a review of my last year, the hopefully first of many, in The Hidden Lane. Also this is my first blog post on the new web page. My other wordpress blog has been running since April 2010 and covers in pretty full detail the ups and downs of those 2 years. 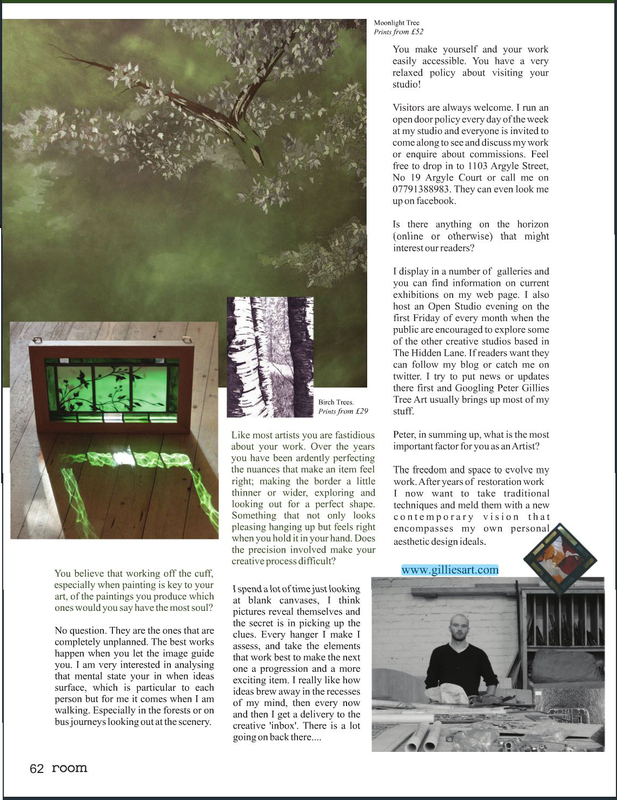 I made the decision to maintain both making this one more updates of my professional news, the other keeps to the theme of being an insight to the studio & working life of an artist. 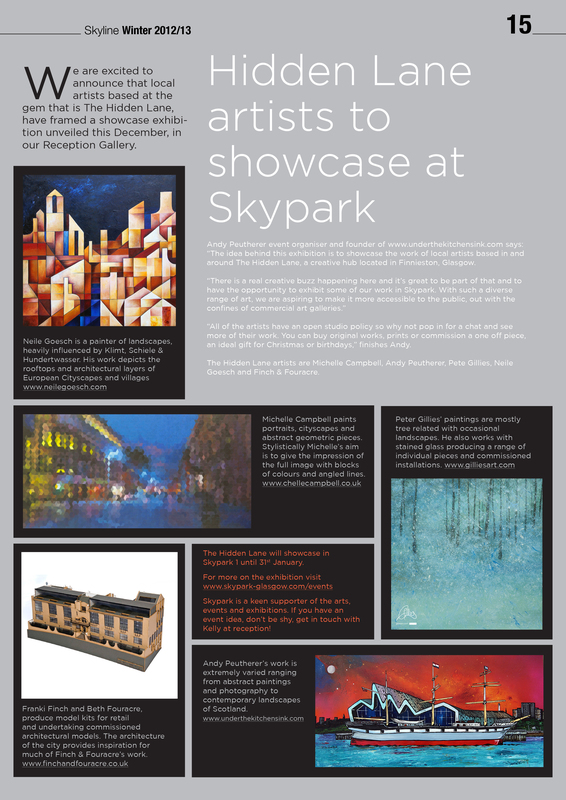 So I have an exhibition running currently in a local business center called ‘SkyPark’. These are two adverts, one produced by Skypark for their in house newsletter & another feature from I-on Magazine which is online and in the printed magazine. So the artists taking part are Michelle Campbell, Andy Peutherer aka Under The Kitchen Sink, Peter Gillies, Neile Goesch and Finch & Fouracre. Pink Grapefruit Furniture Restoration / Finch & Fouracre Model Makers / Gillies Stained Glass & Art / Volcanic Tongue Record Shop / Shona Fidgett Jewelery / Under The Kitchen Sink Art / Michelle Campbell Art / ChouChou Courture Fashion / Euan McWhirter Jewellery. Other highlights from the year were most importantly getting this webpage up and running. Designed by man of many talents Somhairle MacDonald he not only designed the whole look of the page but also did me my logo. Getting the work together to actually put on the web page was a massive turning point this year, with help from Andy at Scottish Landscape Painting, I got all my work photographed and organized so I could actually produce prints of my paintings. The creation of the web page and the options it brings has been a long time coming for me, and very glad its here. In my Glass work I have not made the same quantity of hangers as I normally produce and the ideas that are worked through in that production have not been as wildly exploreative as in previous years. 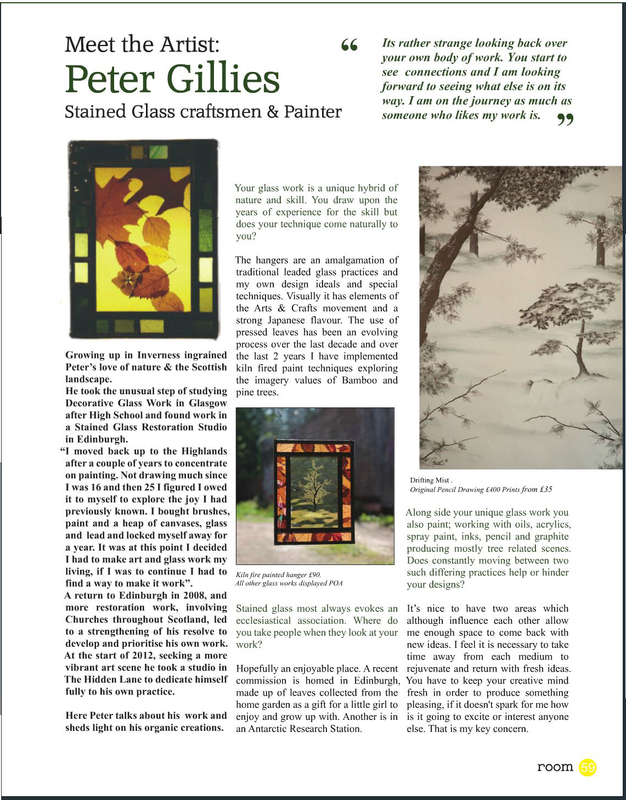 The year has been mostly taken up with more business matters but I did introduce early on in the year my wood framed windows. Framed in American White Oak, to be chained up in front of the window, I produced a set of 4 windows. 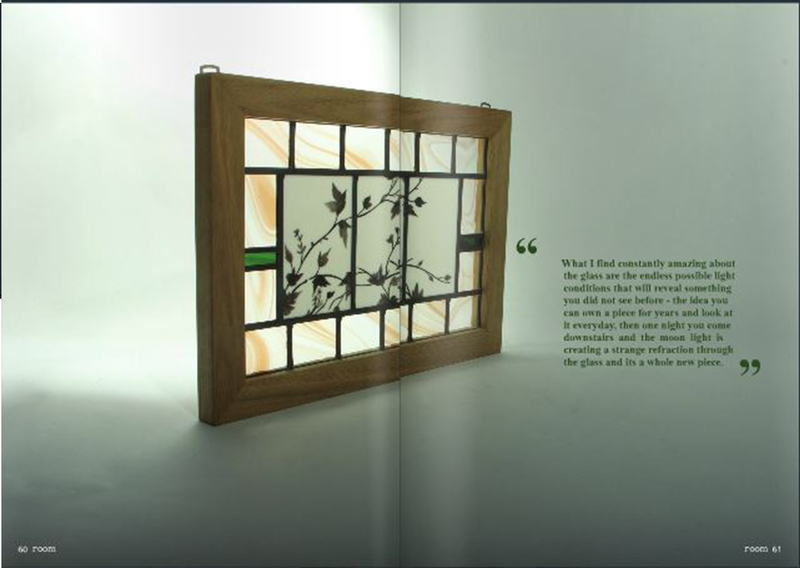 Each hand painted & kiln fired, styled around the concept of a Japanese multi panel screen or painting. This introduction opens up a new path I am very much looking forward to exploring as I have not seen anything produced by anyone else like these. The main idea I explored this year was using an engraving technique in a tree design with the foliage all engraved, as the sunlight passes through the engraved detail it would refract and become highlighted and sparkle. These turned out very well. So as I wrap up this year I know am looking to what the focus for the next year will be. Hopefully more painting and the stocking of Uk shops with my prints. I currently have work in 4 stores and would like to vastly increase that in 2013. For the studio the ongoing Open Evenings will continue and hopefully grow to incorporate more studios and more elements such as live music. The long standing record store ‘Volcanic Tongue’ specializing in underground and experimental music moved premises to within the lane last week and with their presence as more of a retail unit I hope we can get the public’s head round the acceptance of an alternative shopping experience happening in places such as The Hidden Lane. All in all I think its been a good year and I have faith it was a great decision taking the studio and the untapped potential for creating a business in the Lane is vast. So with help & collaboration with the other artists here I hope we can do even more next year. Until the next update in early 2013, see you soon! !